A few more random notes about the New York streets. Part One of the New York streets series can be found here. The Dover Street Bridge (seen as the continuation of Dover Street, far left) across the Fort Point Channel was the site of the first bridge to South Boston in 1805. The location of the bridge, well away from the main settlement of Boston at that time, served to retard the growth of South Boston (which had been annexed from Dorchester in 1804) for many years until the construction of a free bridge (the first bridge was a toll bridge) in 1826, which was more convenient to downtown Boston. The free bridge was followed in 1854 by the Mt. Washington Bridge. New York streets project demolition in progress, from the Boston Streets photograph collection ca. 1855-1999, copyright The Bostonian Society. The information below is from the Record of Streets, published in 1910 by the City of Boston Street Laying-Out Department. For a history of the bridges in this area, click here. Seneca Street, Boston, 1849; from 308 Harrison Avenue to 209 Albany Street; called Erie Street, 1844; named Seneca Street, 1849; lower part of Seneca Street, next to Albany Street, accepted November 19, 1857. Oneida Street, Boston; from 320 Harrison Avenue to 219 Albany Street; from Harrison Avenue, east, 1844; to Albany Street, 1845; accepted, January 5, 1856. Oswego Street, Boston; from 330 Harrison Avenue to 235 Albany Street; from Harrison Avenue, east, 1844; to Albady Street, 1845; accepted January 5, 1856. Rochester Street, Boston; from 350 Harrison Avenue to 251 Albany Street accepted and laid out as a public highway, October 17, 1855. Troy Street, Boston, 1845; from 360 Harrison Avenue to 257 Albany Street, laid out and widened June 20, 1871. If you have questions or comments, please don't hesitate to get in touch. I love hearing feedback from my readers. 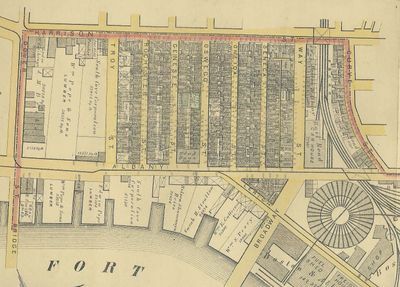 Albany Street, Boston and Roxbury, 1839; from 83 Beach Street in Boston to 88 Eustis Street in Roxbury; projected in 1839 by South Cove Corporation from Beach Street southward; extended by said corporation to Troy Street in 1845; extended by City to Roxbury creek (canal) April 21, 1855; extended across Roxbury canal and Roxbury town wharf or landing-place on Northampton Street, June 30, 1868; Davis Street in Roxbury, from Northampton Street to Eustis Street, named Albany Street, April 21, 1868; this street in Boston was accepted in portions as follows: Beach Street to Harvard street, August 10, 1847; East Orange Street to Rochester Street, November 8, 1852; Harvard Street to Oak Street, October 10, 1853; Oak Street to East Orange (now Way) Street, December 17, 1855; part from Rochester Street to Troy Street seems never to have been expressly accepted; Troy Street to Dover Street, December 22, 1865; Dover Street to Malden Street, December 28, 1858 and May 28, 1859; Malden Street to Springfield Street (now discontinued), September 4, 1866; part from Springfield Street to Roxbury canal seems not to have been expressly accepted; under order of City Council, approved October 2, 1868, a bridge was constructed across Roxbury Canal in 1868-69, "whereby uninterrupted communication would be furnished over Albany Street." Where is (or was) the Mt. Washington Avenue bridge?